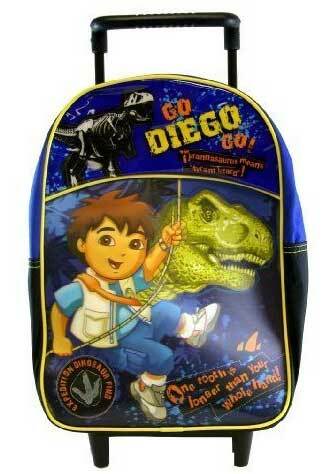 The Go Diego Go Dinosaur Rescue 3D Dinosaur Backpack offers your toddler a choice. They can wear this 3D dinosaur backpack on their back or they can choose to roll it along using the retractable handle and wheels. The Go Diego Go Dinosaur Rescue 3D Rolling Backpack has fun colorful 3D lenticular graphics on the front with Diego and T Rex. Retractable handle and wheels . 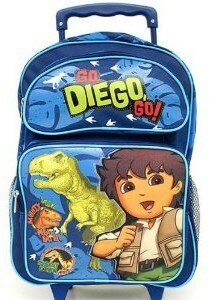 If you are looking for a larger Go Diego Go Dinosaur Rescue Backpack this one measures 12 in X 16 in X 5 in and is designed for school age kids but still features the retractable handle and wheels.